50,000 people came to Rio. Hundreds of thousands more participated remotely. They are spreading the word. Collectively, we must force government leaders and corporations to do what is right for our planet and its resources. IT would be easy to conclude that the Rio+20 Earth Summit was a failure. That would be wrong. Our planet is getting hotter and more crowded with every passing day. Addressing its most serious problems is more urgent than ever. So what did government negotiators do at the summit meeting in Brazil, which concluded yesterday? They spent months negotiating a document that ended up being watered down almost to the point of worthlessness because of their lack of vision and their governments’ lack of leadership. But as presidents of two major environmental groups who attended the Earth Summit, we disagree that Rio+20 was a failure. Certainly, the document produced by negotiators was not even close to what it should be. It did not deliver the commitments we need to reduce carbon pollution and increase clean energy development. It did not do enough to address shortages of food and water and other threats to a sustainable future resulting from population growth, our governments’ woeful failure to collectively address climate change and the rapacious abuse of our natural resources. It did offer some bright spots — such as progress on protecting the high seas from pollution, overfishing and acidification — although it left other dire threats unaddressed. Chief among these was failing to negotiate a treaty to protect ocean biodiversity. But what we must remember is this: Rio+20 is not just about a document. Rio+20 is a catalyst. It is the starting point for change, not the finish line. It is a call to action for all of us who now realize that we can’t just rely on government negotiators or verbose and hyper-compromised documents to save our planet. We must do it ourselves. We can do this ourselves. We saw in the myriad Rio+20-related announcements from countries, communities and companies around the globe that they were taking action themselves — irrespective of any United Nations document. World development banks agreed to invest in a cleaner transportation network, for instance. Developing countries agreed to phase out incandescent light bulbs. Australia, Mexico and other coastal countries committed to protecting their irreplaceable seas. We heard it from the young people who spoke at Rio+20 — sometimes through tears and with cracking voices — about the fears they have for the world we’re leaving for them. Most of all, we recognized that the world’s people can assert their will and power to fix our problems. The fact that 50,000 people came to Rio and that hundreds of thousands more participated virtually through technologies like YouTube and Twitter made that loud and clear. The incredible energy and the enthusiasm they demonstrated is only a hint of what individuals can do. What Rio+20 did was shine a spotlight on the environmental and sustainable development issues we all know we must address. For at least a few days, it forced us all to pause, take stock and think about the legacy we’re leaving our children. Now that the speeches are done and the negotiations are over, and the world’s leaders are heading home, it’s time for the rest of us to take action. Individually, we must be efficient with the energy and the natural resources we consume and be ever cognizant of what the decisions we make today will mean for our children’s planet tomorrow. Collectively, we must force our government leaders and our corporations to do what is right for our planet and its resources. We must press them to implement the commitments they made at Rio+20, and the commitments they made in other international agreements as well. And we must hold them accountable when they don’t. As we learned at Rio+20, government negotiators and thick documents can’t save the planet. But as we also learned, we can, and we must do it now. Frances G. Beinecke is president of the Natural Resources Defense Council. Trip Van Noppen is president of Earthjustice. 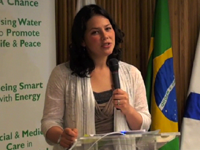 22 June, 2012/Rio de Janeiro: Political leaders attending the Rio+20 United Nations Conference on Sustainable Development have failed to meet the pressing environmental and social challenges that the world faces today, according to Green Cross International President Alexander Likhotal. Green Cross International, which was founded by President Mikhail Gorbachev following the 1992 Earth Summit in Rio, was calling upon the leaders to update the view of economic development, and develop a roadmap for transformative action to put the global community onto a path towards truly sustainable development. “But for many political leaders, ‘green economy’ is merely a convenient term used to rekindle the same global economy with some environmental-friendly intentions or actions on the side,” Mr de Oliveira says. However, concludes Mr. Likhotal, the overall Rio+20 event, which included strong civil society participation, is not a complete failure. “The Conference’s primary outcome is not about agreements that were reached, or rather not reached, the relative merits and demerits of which will be debated endlessly in the months ahead. Green Cross International (GCI) is an independent non-profit and nongovernmental organization working to address the inter-connected global challenges of security, poverty eradication and environmental degradation through a combination of advocacy and local projects. GCI is headquartered in Geneva and has a growing network of national organizations in over 30 countries. "My climate epiphany wasn't overnight, and it had nothing to do with Al Gore."